SunYuan Technology the Newest developed blood analyzer and blood cell analyzer dedicated DC-DC Converter(patent number ZL 2015 2 0143321.7), using advanced DC-DC conversion boost technology and unique vacuum insulation potting process, the shell is made of metal Shielding and it have moisture and shock proof, high efficiency, high power density, low noise temperature drift, anti-EMC electromagnetic interference and so on. Widely used in metallurgical prospecting, light control technology, medical instruments, physical and chemical analysis and so on. 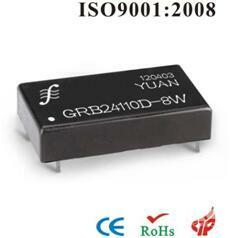 Power input voltage: 4.5-9VDC, 9-18VDC, 18-36VDC; standard (2:1) wide input range. Output voltage: 80VDC, 100VDC, 110VDC, 150VDC, 200VDC, 250VDC, etc. The output has multiple protection functions such as OTP, OCP, UVL, SCP, etc., users can choose with confidence. 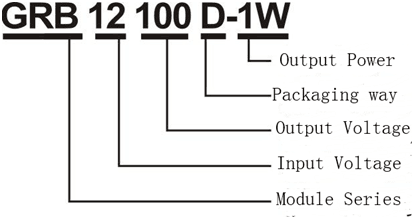 Example 1: Input voltage Vin: 9-18VDC; Output voltage Vout: 110VDC; Output power: 2.5W. Example 2: Input voltage Vin: 18-36 VDC; Output voltage Vout: 150 VDC; Output power: 5 W.
1. Low cost, small size Sip 7Pin flame-retardant package, high surge resistance against surge 4KVAC (6KVDC), output power 0.2W/0.5W/1W/2W. 2, Small size Sip 7Pin flame retardant package, 8KV anti-static, anti-surge, 3KVAC (6KVDC) high isolation, regulated voltage output (1% accuracy)it with self recovery overload short circuit protection. Output power 0.2W/0.5W/1W/2W. WRF / WRH series: 5VDC/9VDC/12VDC/15VDC wide voltage input/regulated single output, self recovery overload short circuit protection function, the output voltage is unchanged when it at no load. VDH / WDH series: ++ 5VDC /++ 9VDC /++ 12VDC /++ 15VDC wide voltage input / regulated voltage dual isolated output, and with self restoring overload short circuit protection function, the voltage is unchanged when it at no load. DC-DC Converter module protection circuit reference. IB/VB series VBXXXXS-1W/2W products, the isolation voltage is 1KVAC between input and output, strong anti-interference ability. Constant voltage input and Regulated voltage output (nominal error < 2%), the output has self recovery overload short circuit protection function. Standard SIP 7 Pin/DIP 14 Pin flame retardant package. B series BXXXXS-W5/1W products, the isolation voltage is 1KVAC between input and output. Fixed voltage input & non-regulated output (nominal error < 5%) standard SIP 4 Pin / DIP 8 Pin low cost, small size flame retardant package. It is widely used in computer 232/485, remote communication and intelligent control. We designed and produced a series of high isolation dc-dc converter module with anti-surge and anti-static interface RS485 according to the requirements of electronic industry instrument manufacturers such as distribution load tester and power management terminal and basis of the national electronic industry standard (DL) DL/T614-1997 and (DL) DL/T614-2007. The DC-DC converter module used in these electronic industries has the following functions: anti-surge 4KVAC/6KVAC high isolation, 8KV anti-static, output voltage stabilization (2% accuracy), also with self-restoring overload short circuit protection output and so on. Common product specifications have: 3KVAC/6KVAC high isolation, output power 0.2W/0.5W/1W/2W, 5VDC/9VDC/12VDC/15VDC single voltage output, +5VDC/+9VDC/+12VDC positive and negative double voltage output and ++ 5VDC/++ 9VDC/++ 12VDC/++ 15VDC double isolated double voltage output. DC-DC anti-static Converter module specially designed for multi function watt-hour meter of national power network has the functions of output voltage stabilization self restoring overload short circuit protection and 8KV anti-surge static protection. D S series constant voltage input, 1KVAC double isolation double circuit unsteady voltage output DC-DC Converter module is mainly used in instruments, transducers, CNC equipment and other occasions that require multiple distributed power isolation. Standard SIP 7 Pin/DIP 14 Pin flame retardant package. 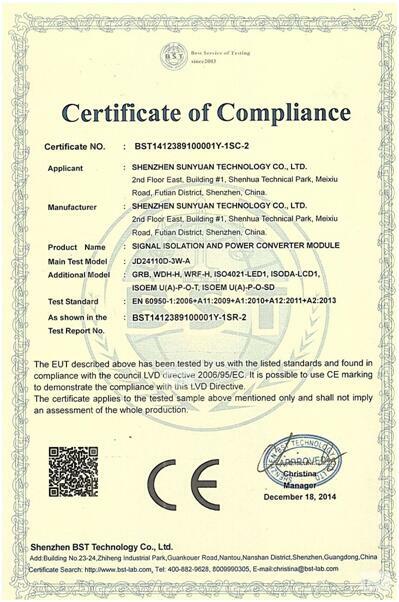 9-18VDC, 18-6VDC (2:1) wide voltage input, 100VDC, 120VDC, 150VDC high voltage output, with high power density. It is widely used in medical instrument manufacturing industry. It is specially designed for isolating power supply and distribution between pressure, displacement, temperature and humidity sensors and transmitters. 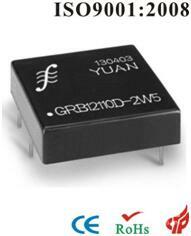 The products are characterized by high isolation, small size and ultra-low power consumption. They are widely used in CNC machine tools, instruments, industrial control intelligent and other fields. Sunyuan Low Cost Compact Economic Dual-isolation Amplifier Released!